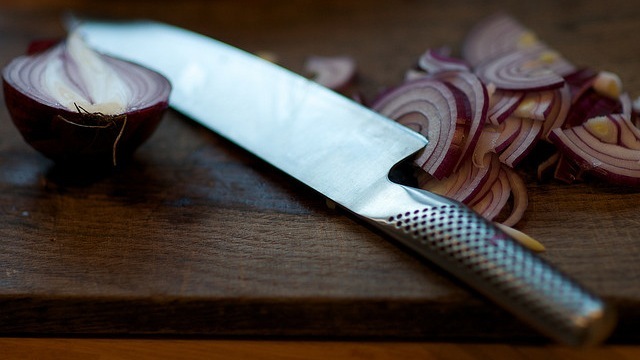 If you keep your cooking knives in a drawer with the rest of your utensils, you may be doing some serious damage to them, partially because they’re rattling around in there and bumping up against other utensils, and partially because they’re running into corners and the sides of your cabinets. In addition to keeping them sharp and well-honed, getting them out of that cabinet will drastically improve their longevity. Over at Kitchen Daily, they run down a list of common knife storage and cleaning mistakes that could be inadvertently dulling your blades, but keeping them in the utensil cabinet is one of the bigger ones we can see more people doing, especially if you don’t have a block to keep them in. They even have a great shot of a damaged knife that was improperly stored to prove the point. So what do you do? We’ve already discussed why you should skip block sets and buy one or two good knives instead, but if you have loose blades, how do you keep them if you don’t put them in a drawer? You could always pick up some knife sleeves or a knife roll if you have to keep them in the drawer, or store them on the wall with a DIY magnetic knife strip. If you have a block, you can always try turning the blades upside down to keep them from dulling as you remove and replace them. How do you store your knives? Let us know in the comments.